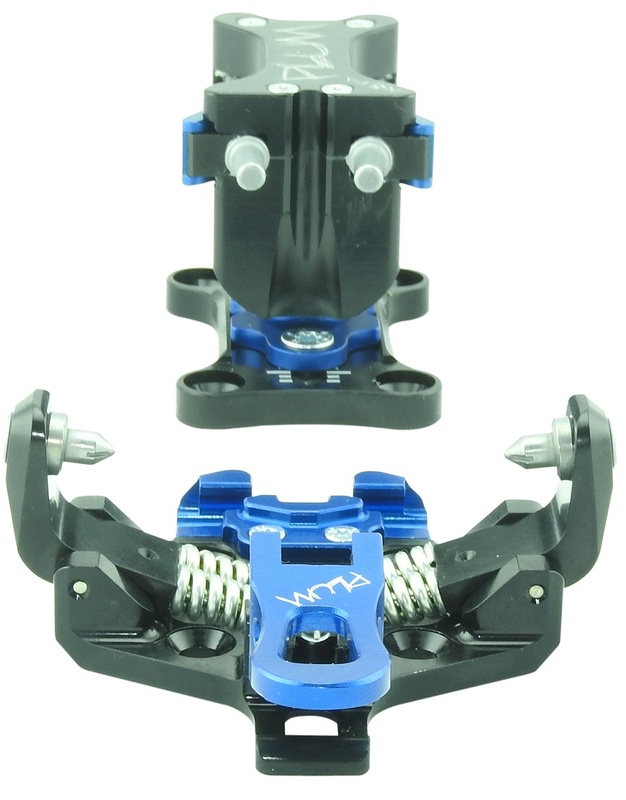 Re-designed race toes have fully-functional toe levers that are easier to operate. 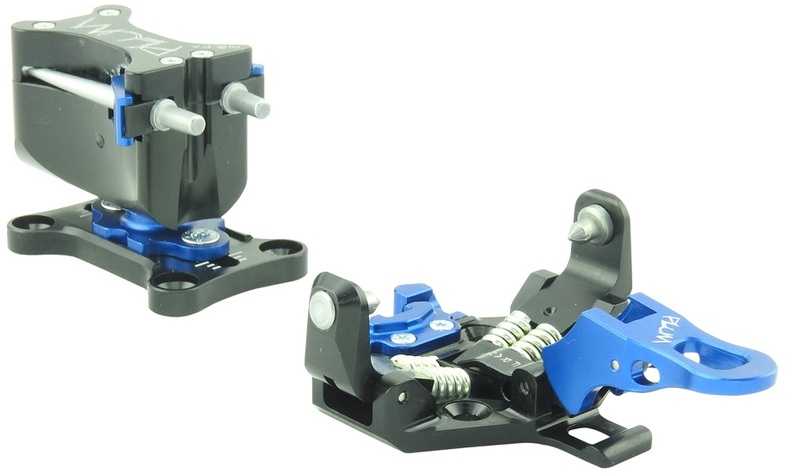 Rotating heel piece has adjustable lateral and forward release settings, from 5-10. Built-in adjustment plate has a range of 20mm, enough for 3 full boot sizes. 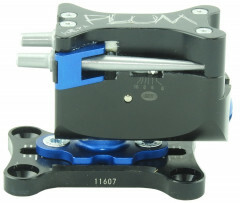 Heel rotates in either direction for boot-on-housing and flat-on-ski modes. Includes a pair of Plum leashes that will save you from chasing skis downhill. Optional re-designed, machined-aluminum receptors accept most crampons. Plum crampons can be placed into the receptors from the top, without sliding. Update 2017/18: Plum reshaped the toe lever to avoid unlocking problems with some boots. All of our inventory has the updated levers. 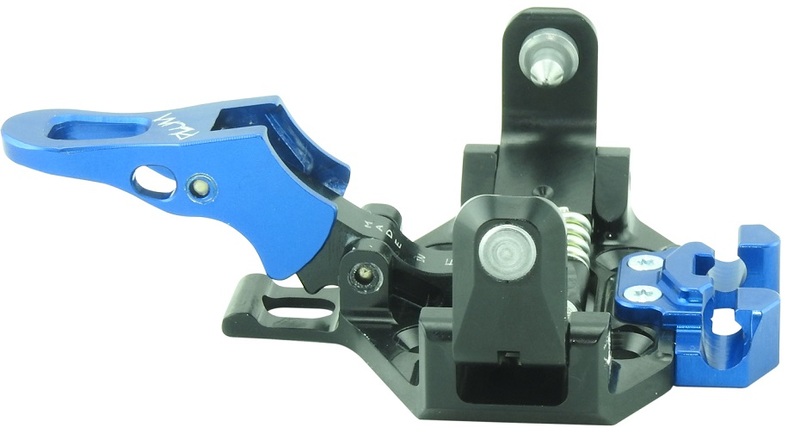 I saw the question posed by another person about buying the tops of a Pika binding to use on a Wepa and I’m curious to see if that is an option. Hey Dabikes! Not yet. If we can source any we will definitely share that info, but as of now that's still not an option. Hey Plum(b)er! I don't think that Plum has ever offered that as a spare part, although it looks remarkably similar so I can't think of a reason why not? Although finding the parts is going to be the hardest part. Send me an email and I might be able to secure those parts for you. No promises though because like I said, they haven't ever been available as a spare part. "Update 2017/18: Plum reshaped the toe lever to avoid unlocking problems with some boots. All of our inventory has the updated levers." I can't find any information on Plum's website and I own a 2016/2017 version, do you have any more info abou this jbo? I haven't noticed any problem with mine and they released correctly in the past too. Hi Nico, if they work with your boots then you should be good to go. Feel free to ask any specific questions. I was wondering how hard these could be skiied. I'm planning on doing some skimo racing this year, so weight is important, but I also want something I can ski downhill well. I do a lot of skiing in tight woods and trees, so they need to turn well - ideally, I want something I could use in almost any scenario (although I don't do any cliff hucking or anything super extreme). Would these work, or should I look at other bindings? Hey Wright, thanks for reaching out! Short answer: Hard, very hard. If most of your skiing occurs with both skis on the ground in the backcountry (as opposed to the very different set of demands imposed by getting air and diving into mogul fields with reckless abandon) then these will be more than adequate as long as your release values line up appropriately. A common misconception is that weight correlates directly with downhill performance and durability. Even the lightest race bindings often times have higher performance than a lot of their "heavier" brethren on both the climbs and descents. We see some pretty heavy and very hard charging skiers on tiny little race bindings and they hold up just fine. It's only when you start messing with ridiculously big skis or hucking huge cliffs in the backcountry that the set of demands really changes. What skis and boots are you planning on pairing these up with? I'm not totally sure what skis I'm going to use with these, but probably something in the 90-95 underfoot rage, 172 or 177 cm length. As for the boots, I'm planning on using the Dalbello Lupo AX boots. I have one more question -- I don't huck cliffs, but there is every chance that I might accidentally launch a foot or so in the air off of a root or rock or some other of the many obstacles new england tree skiing has to offer. Would I eject from the impact of a minor jump like that, or do I really need to be sending massive drops to need beefier bindings? Hi Wright, absolutely no problem! Well within the limits of these or other tech bindings. In our view, the folks that really need the CAST binding know who they are. Hey so, these look like they might require the user to bend down to swivel the heelpeice around between ski mode and the two walking settings. Is that correct? Hi Chris, good read. Indeed, if you can't bend over, this is not the binding for you. I've skied these bindings for a season now mostly racing uphill with some spring tours as well. The bindings are very well constructed and will likely be very durable. I like the ability to adjust release values. I've had issues with the toe pieces not releasing easily leaving me fiddling at transitions and at times having to forcefully push the toes down with my poles. I've had the issue with some Dynafit boots and my Scarpa F1's. Both toes are fairly worn down though the Scarpas I've also had to cut down the toe sole rubber to ease the toe release. I contacted Plum at the end of the season and they promptly sent me new toe pieces that they claim should solve the problem though I haven't had the chance to ski them. If the Plum race bindings are just as tough and well constructed I might have opted for a pair of them had I known I'd have issues with the Wepa toes, and some of the Plum race heels have an optional taller heel riser if you want one, the Wepa heel doesn't have that option. The Plum crampons drop in nicely from the top, also it seems B&D crampons will also slide in from the sides nicely, they're a little loose but mine seem to slide in and stay put (at least in the house, not sure on snow). I'm impressed with the construction and feel of the Plum Wepa's, and hopefully removing a little more toe rubber (as advised by Plum in addition to what I've already removed) and replacing the toes will solve the issues. Thanks for the feedback Smac. Yes, Plum made an inline toe lever change on the WEPA (and the race bindings) to help accommodate more boots. Modifying boot sole rubber is always a possibility with the tech-toe interface. Hey, I am dreaming a up a crazy light powder touring setup and curious if this binding fits the bill. What are the heel riser's comparable to? What are the two heel heights when climbing? Is it taller than the Dynafit Superlite heel risers? Hey Tyler! Because the height of the toe will factor into how high the risers actually "feel" you should focus on the difference between the toe pins and the risers for each binding. The Superlite 2.0 Toe is 28.5mm, first riser is 28.5mm, and tallest riser is 48mm (total difference of 19.5mm). 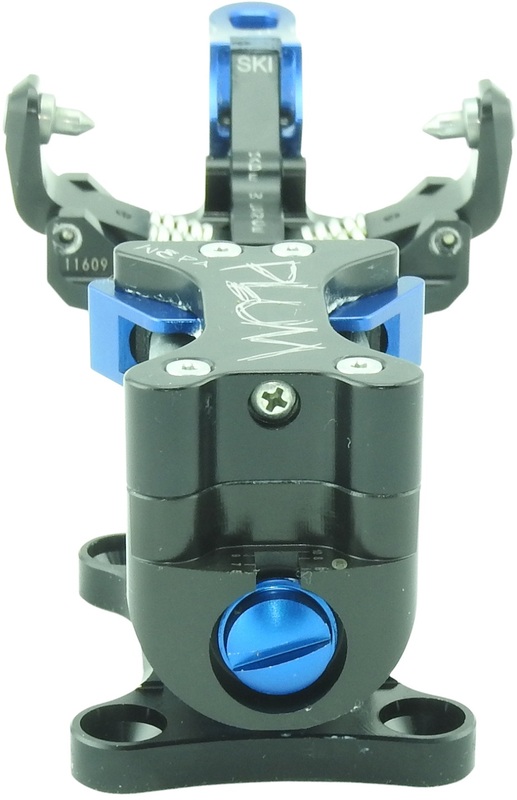 The WEPA has a slightly taller toe piece at 31mm but a higher riser at 52mm (totaling a difference of 21mm). Hi, does the dynafit crampons fit these bindings? Hi dkjs, the Dynafit crampons don't slide into these receptors out of the box unfortunately. I'm a happy user of kingpins but sadly for long trips I just need something lighter. Before that, I used to own some dynafit radicals on a pair of carbon skis and was never able to ski as aggressive and fast as I now can on my kingpin setup. Could have been the boots, the skis or the bindings... Either way I was thinking of buying a pair of wepa, hoping it would ski a bit more "rigid" than my old radicals. Am I completely dreaming and the wepa will probably feel exactly like radicals? Hi Nico, most tech bindings will feel about the same, with a slight stiffening effect in models without a heel gap (the housing rides on a spring which adds resistance to ski flex). I wouldn't expect much difference in the WEPA vs Radical 1.0 series in terms of ski performance. Note the Radical 2.0 feels a bit stiffer, but that's in a different weight category. The ION LT might be the sweet spot for you. Thanks a lot for your answer. Sadly since I changed virtually everything between my two setups, I'm having hard time to make sense of the impact of the bindings on my skiing (pretty sure boots had a lot to say in my case). Hi Nico, I'd of course go for light skis, boots, and bindings :) There exist each that perform well. Send me the details of the two setups you had and I'll try to diagnose what you were feeling. Also include your vitals (height, weight, skier type) in an email to help@skimo.co. Any idea what the pin delta is on these? Hi Michael, we just posted our measurements to the article on pin heights. Looks like these have roughly 12mm of delta.